...and suddenly it all seemed moot. Yeah, I'm pretty sure there are muses for all endeavors. So, what kind of muse do you have? And what muse methodology works best for you -- gentle and cajoling, or armed and dangerous? I have no idea about my muse. It just seems to happen. Mine's more along the lines of a drill sergeant. All of them. Summer -- the ever-reliable Drill Sergeant muse. Always effective. Kerry -- Go for it! May you find it suitably inspiring. My brain is creative enough, it's only once a month I need a bit of cajoling. Luckily, all my successful author friends have been writing more lately, so the race is on. A bit of competition gets me going. My muse is a TEASE. Some days, he waves chocolate under my nose, whispering the perfect word in my ear. Other days, he's sprawled on the sofa with the remote control, a beer, and a bad attitude. Lately, he's been snapping a whip. I don't quite know what to make of that. Ha-ha, this was too funny. 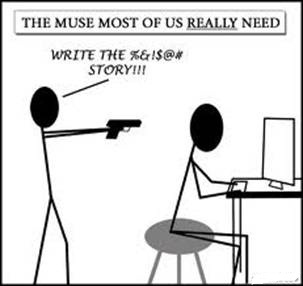 I wish my muse was bit more aggressive, but we have a good working relationship. Thanks for the laugh. LOL - I really could use a muse like this! One of the best things I do for motivation is attend sessions of The Practice Room (by Tina Laurel Lee) where groups of writers meet online, write for a solid hour (unplugged from the internet, TV, etc), and the meet again for a chat to talk about progress. Recently, Tina has also started having these meetings via Google+. This is even better, because you can see everybody writing! My muse is like Yoda...tricky, sneaky little guy. And he's friends with the Wookies. Who knew? My muse for all creative activity used to be the "If I play guitar I can pick up girls" muse. These days my muse is the "If you stay in bed you'll get bed sores" muse. Wow. Well, that is just too perfect. My muse, I think, is a combination of coffee, misery and that crazy-excited feeling after I read a really good book! Dianne -- That does sound motivating, but I tend to buckle under the clock. I need to ignore time completely when I'm writing. B & B -- Ha-ha! Our muses must adapt with us over the years. I laughed out loud and received WTH looks from my dogs. This IS my muse. i thought i needed a gentle and cajoling muse, but seeing that pic makes me think i need something with more of an edge to scare me into production. My muse? I better get this done. Only x amt of hours till I kick the bucket. LOL!!!! Love it. And I need *that* kind of muse right about now. Will you send one my way?? This? This is just perfect. This is my whole life. Kasie -- Sure. One muse, armed and ready, heading your way! Keriann -- Ha! I'll have to check out that Twitter group. You find some of the BEST pics for your blog! Love all the camels, and REALLY love this muse pic. Me, my muse is being a little quiet lately. I don't think he's been getting enough sleep. Haaaaaaaaaaaaa, oh boy can I relate to the stick figure! I find my muse likes swimming in the bottom of a glass of wine, and usually in the wee small hours.. I definitely respond to threats. My muse is mean and hangs back until I've overdone the lazy, then KABOOM! Both barrels. Than the old nine which rhythmers invocate"
I think Shakespeares tenth Muse is could be the key inspiration of the madcap comic images of Virtual Reality;brilliant as usual and congrats to author and muse both! Now THAT will definitely motivate you to write. Dianne's comment got me thinking, though. It's a great idea for writers to motivate other writers. Plus, it's a great way to meet new people online! I would love to join that group. Planes, trains, and ... um, camel vans? Hooky, Hooky, Hooky! Let's Play HUMP DAY HOOKY!!! Just pinch me and call me Cinderella!